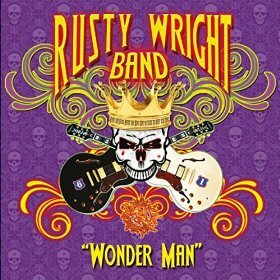 I just received the newest release, Wonder Man, from the Rusty Wright Band and these guys know how to rock! Opening with title track, Wonder Man, RWB sets a pop rock pace with a catchy tune and a solid rhythm. Wright, backed by Laurie LaCross-Wright on guitar and vocal, Dennis Bellinger on bass and vocal, Robert John Manzitti on keys and Marc Friedman on drums. Ain't That The Blues slows the pace a bit but maintaining a solid blues rock feel. Wright has a good voice to lead this band and his guitar riffs are fresh and fluid. Manzitti leads the way on Black Hat Boogie, a rolling boogie with a driving bottom. Blended vocals coupled with the styling puts me in mind of a polished Molly Hatchett. Rusty pulls out the slide and shows his clean sliding style. Smooth blues rocker with a jazz flare, You Know I Know, shows the versatility of the band. Nicely articulated guitar soloing and meaty organ riffs give this track a nice kick. Straight up rocker, Love's Gonna Treat You Right has all of the good components of John Cougar and 38 Special rolled into one. A straight to the airwaves track. Gonna Come A Day is a cool, down to earth blues track built along a T-Bone Walker theme. Wright's lead vocals and meaty guitar solo's make this my stand out favorite track on the release...oh yeah! Corvette Sunday has a 60's rock kind of flavor with twin leads, bass and drum solos and even keyboard leads. Rabid guitar riffs and solid drumming keep this track just outside of the surf scene. Cool! Arms Of Another is an easy paced rock track. Manzitti takes a nice key solo and Wright and Bellinger's vocals blend nicely. There is a particularly nice guitar bridge in this track that stands out nicely. Whiskey Drinkin' Woman is a heavy bottomed blues rocker with the feel of a modern Willie Dixon. Wrapping the release is Chinfoot Ball, a hot rocker with a driving drum beat. Wright not only has a solid hold on great melodic composition but also know the fine art of dynamics and harmonics. Cool release!